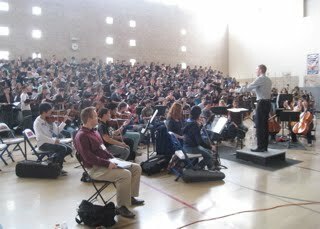 The big event of the day was the rehearsal (with our terrific orchestra) of Daniel-Lesur's "Annonciation." Christian Lesur, son of the composer, took the speaking part which Frederica Von Stade will do tomorrow. Matt Curtis sings the part of the arcangel Gabriel. After an hour and a half of rehearsal we ran it without stopping - it's beautiful, and although perhaps we shouldn't be the ones to say it, we thought it sounded really pretty good! Our audience will be the judge tomorrow night at Davies Symphony Hall.